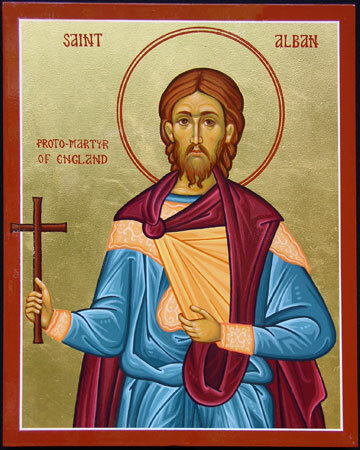 SAINT ALBAN was the first martyr in the British Isles; he was put to death at Verulamium (now called Saint Albans after him), perhaps during the persecution under the emperor Diocletian in the year 303 or 304, although some say that he gave his life in the reign of the emperor Septimus Severus, around 209. According to the story told by St Bede the Venerable, St Alban sheltered in his house a priest who was fleeing from his persecutors. He was so impressed by the goodness of his guest that he eagerly received his teaching and received Baptism. In a few days it was known that the priest lay concealed in St Alban’s house, and soldiers were sent to seize him. Thereupon the St Alban put on the priest's clothes and gave himself up in his stead to be tried. The judge was angered at the priest’s escape and threatened the saint with death if he persisted in forsaking the gods of Rome. He replied firmly that he was a Christian, and would not burn incense to the pagan gods. He was condemned to be beaten and then beheaded. A spring of water gushed forth from the place of the martyr’s execution, and it is said that, at the moment at which the saint’s head fell to the ground, the eyes of his executioner fell out of their sockets. Before this spectacle, the governor ordered that the persecution of Christians cease, and that due honour be paid to the glorious martyrs of Christ. From that time, many sick people found healing through the numerous miracles wrought at St Alban’s tomb, and his veneration spread throughout England and also in Europe. The shrine of St Alban had lain empty since the destruction of the English monasteries by King Henry VIII, but in 2002 a portion of the martyr’s relics was taken there from the church of St Panteleimon in Cologne, Germany, where they had been preserved for many centuries. These relics now lie once more at the place of the saint’s martyrdom.